Knox fought with the XI th. International Brigade in the Spanish Civil War from 1937 to 1938. He was badly wounded. In World War II he was, as a soldier of the US Army, involved in covert US / British / French operations in France and Northern Italy. Bernard Knox's book The Iliad was available from LibraryThing Early Reviewers. 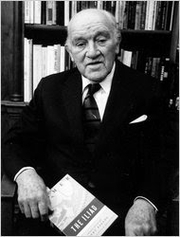 Bernard Knox is currently considered a "single author." If one or more works are by a distinct, homonymous authors, go ahead and split the author. Bernard Knox is composed of 17 names. You can examine and separate out names.